In America there are two residences that we are proud of, our nation and our state. Given the unique set up of our country, each state has its own culture that has a large impact on our lives. 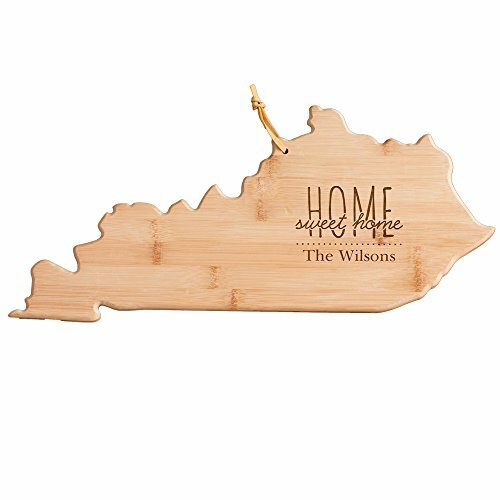 Honor your family name and proudly show off your favorite state with this personalized cutting board. This one-of-a-kind carving board is the perfect addition to any kitchen! Made of a premium quality bamboo, this board has a harder surface and is more durable than a normal wood cutting board. 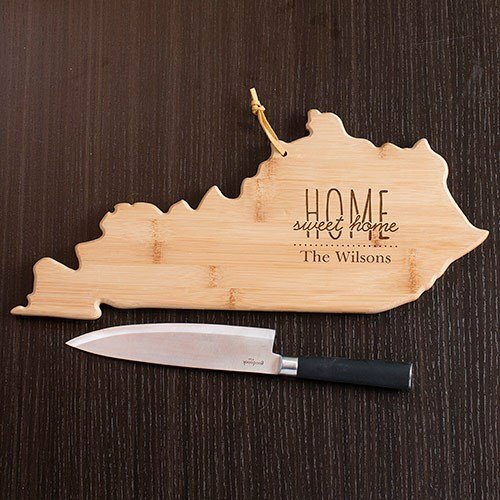 Each cutting board is shaped like the state of Kentucky, which makes it the perfect gift for the Kentuckian in your life. They also feature the phrase Home Sweet Home. We will personalize this custom board with any name at no additional cost to you. Whether you are looking for a great gift idea for the holiday season or a birthday, or shopping for yourself, this personalized cutting board is a must have. Give your kitchen a little touch of state pride with a board that is both practical and stylish!